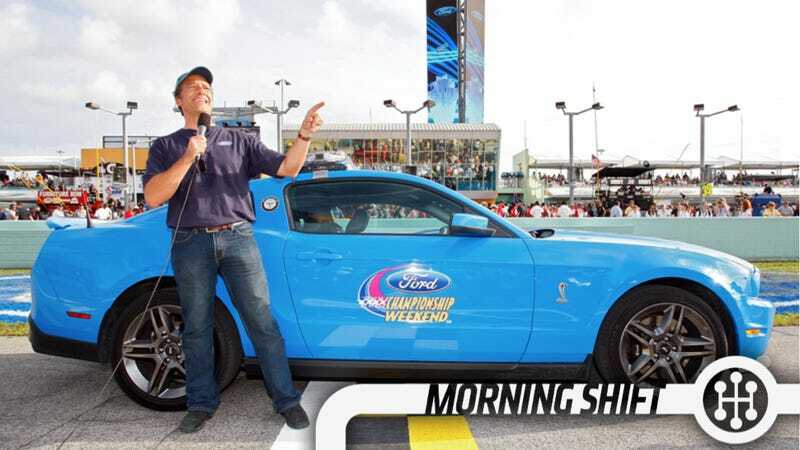 From Ad Age today comes news that Mike Rowe, the face of Ford Trucks, has split because Ford decided it was "time to move in a new direction." On Wednesday, Mr. Rowe also told radio host Glenn Beck he and Ford were no more. "After seven years, we're going in different directions, and I'm wishing them every possible success that any car company could ever have," said Mr. Rowe on the show, calling it "a great run for me." TL/DR Mike Rowe does a show about the kind of rough, dirty work Americans rarely do anymore. It glorified the working man and implied there was no occupation too overwhelming for a gosh darned son of the U.S. of A. Unfortunately, most of the true "dirty jobs" in the U.S. are the ones where you end up working a low wage with demeaning restrictions and bad hours. Like working at Walmart. Thus when Mike Rowe also became the pitchman for Walmart a few people intimated that he'd turned his back on everything he stood for (or, well, when there was a big Olympic TV commercial. This campaign has apparently been running for a year). If I'm honest, I don't personally care either way about Mike Rowe or his choice, and I could be persuaded to believe this whole thing is a bit overblown. Whatever the gap between reality and perception, Ford decided it was the right time to cut Rowe loose. The UAW could probably use a new brand. United Auto Workers carries a lot of baggage, even if the name is accurate. What about the Automotive Labor League? ALL! Who doesn't want to be a part of ALL? I say this because the VW rejection, upon further review, might have a lot more to do with what people think about the UAW in particular and not so much with how they feel about unions in general. Welcome to the newest challenge facing Detroit institutions, from the UAW and its automakers to a City Hall gutting through the nation's largest municipal bankruptcy: they insist they've changed, that bad habits of the past are past. But a history of ballooning post-war entitlements and dubious competitiveness are burdens proving difficult to shed. Not to sound too much like Dr. Sheldon Cooper, but being able to work BMW's iDrive system no longer makes you a genius. As the WSJ reports, BMW's diminishing the role of the salesperson in exchange for "product geniuses" who will understand how the cars work and try to explain them to customers. There will be iPads. So many iPads. Mark Rikess, chief executive of The Rikess Group, an auto consulting firm, says car shoppers could soon see two types of dealers emerging: some going more to a full-service experience, giving customers more attention and concierge-like services. Others could move to a more no-frills model, keeping overhead costs low and adopting a high volume Internet-driven sales model. Porsche temporarily halted sales of the new 911 GT3 after a fire in Switzerland and now they're telling customers to stop driving them and have them taken to a dealership. Right now there are about 785 of the vehicles delivered worldwide and Porsche wants to make sure all of them meet the demise they deserve… flipped on a wall of tires by a dentist. The company says they'll inspect and report back on any findings as soon as they know why this happened. The Department of Homeland Security had apparently been trying to get access to the commercial databases used to track license plates worldwide but, according to Bloomberg, that ain't happening. "The solicitation, which was posted without the awareness of ICE leadership, has been canceled," Gillian Christensen, a deputy press secretary at the agency, said in an e-mail yesterday. "While we continue to support a range of technologies to help meet our law enforcement mission, this solicitation will be reviewed to ensure the path forward appropriately meets our operational needs." Privacy groups understandably didn't like the idea of the government tracking all of your movements all the time. An episode of the hit TV sitcom "Seinfeld" titled "The Pothole" airs for the first time on this day in 1997; it includes a story line in which the character Kramer adopts a stretch of the fictional Arthur Burghardt Expressway through the real-life Adopt-a-Highway program. Neutral: Who Should Be The Face Of Ford Trucks? Since the vehicle is all aluminum I say Captain Planet.